One day, while venturing out of his allowed part of the ocean, Inky, a clever but shy squid, finds a treasure chest. Looking inside, he is particularly drawn to an unusual sparkly belt that he thinks would be great for his mother. While cleaning the sand that had settled over it, he touches the big ruby stone on the middle of the belt. And like magic, out of thin air (or, better, deep blue water), a figure appears, like a genie from a bottle. After a short moment of confusion, we find out that the figure is no less than the King of Music which looks exactly like Elvis Presley. Short after we also find out how the belt and its King of Music got to the bottom of the ocean, and why it needs to return to dry land. The figure asks Inky for help and the squid, despite real and imaginary dangers, agrees to bring the belt to the shore. Which he, ultimately, succeeds. But as they say that it’s not about the destination, it’s about the journey, so this adventure proves to be a life lesson for the squid. By making friends with the Calamari brothers, previously thought to be mean, Inky learns not to judge others by the way they look. And by tricking the Chairman, boss of the sharks (who wanted the belt for himself), the shy squid proves that small but clever creatures can win over the big and mean ones. By the end of the story Inky also learns about music, that he may hear it if he listens for it when he comes at the surface. 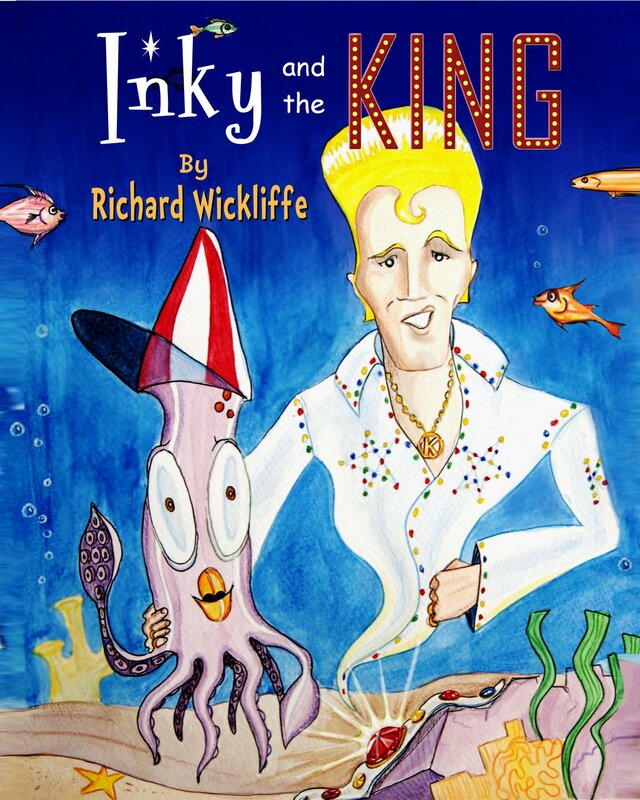 Illustration: Richard Wickliffe is also the illustrator of this book. His colors are bright with an exceptional bright blue overcoming every plate. The drawings are predictable, the characters close to reality and the details are sparse. They not necessarily enhance the story, more they confirm it also portraying the characters whose emotions are well captured. And last but not list, there are some instructive illustration of the anatomy of the creatures in the book.